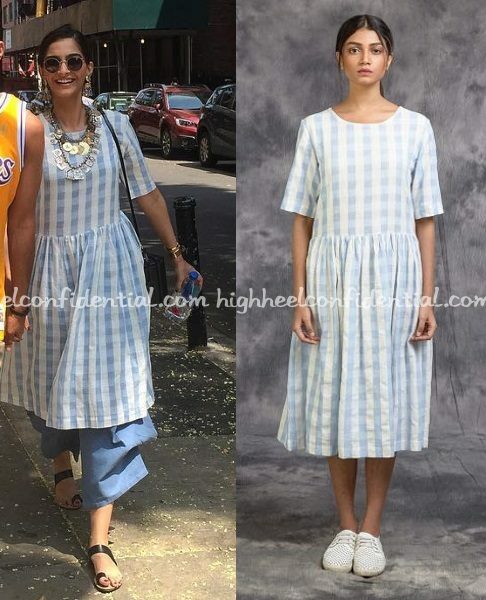 While out and about in NYC, Sonam was spotted wearing a checkered dress from Label Ishana over blue pants with loads of silver jewellery and her Marc Cross bag. I am on the fence about the pants but skip that and it’s a look I’d wear in a heart beat. Especially given this Texas heat! P.S. She was also seen in Payal Pratap maxis, one of which we’ve seen on her before. Catch it inside.